This is my favorite tarot deck that I have ever owned -- or ever seen. I connected with the artwork right away, and it still continues to fascinate me.I don't "believe" in tarot cards as having mystical or divinatory properties themselves, but I do find them to be a very useful meditative tool. Much like seeing a therapist, the practice isn't so much about getting the right answer from a more knowledgeable source as it is applying an alternative method of examining and organizing your own thoughts and feelings. If you're stuck in a particular way of seeing things, having a therapist ask you open-ended questions, or attempting to create meaning from random pictures and symbols, can help get you out of that rut. Both force you to be imaginative about the issue you're dealing with instead of telling yourself the same things over and over again. Even if I haven't definitively solved a problem through therapy or a tarot card reading, I always feel much calmer afterward and I find that I can take whatever comes up next in a much more relaxed and clear-headed way -- and that in itself is worthwhile to me. I'd almost forgotten about how calming and useful this practice has been for me in the past until I read "Little, Big" and was delighted by Crowley's Least Trumps deck. I picked up the Revelations Tarot again on a day when I felt like such a complete failure, like I screwed up so badly that I threw my whole life off track and things will never turn out the way I want them to. I didn't get any answer from the cards about what I should do to make things right or what direction I should head off in, any more than I would have gotten one from my therapist if I was still seeing her - but I did feel better, calmer, more optimistic, and more capable of eventually figuring things out. Traditional Rider-Waite imagery: noMeaning easily derived from imagery: 5 starsTraditional Rider-Waite suits: yesSuits have different themed art: yesIllustrated pips: yesTraditional Rider-Waite Court cards: yesElemental indicators in Major Arcana: noArt quality: 5 starsStandard card size: yesCard stock quality: 5 starsQuality of descriptions in companion book: 3 starsIncluded card container: standard Llewellyn white cardboard boxUnique to this deck: upright and reversed imagery on each cardOverall: 4 starsThis is a great deck designed to help with learning reversals because each card has a blended upper and lower image; the image that faces the reader depends on whether the card is upright or upside-down, thus it's easier to see the reversed meaning. I definitely recommend it for beginners; I taught two people to use Tarot with it.The card stock is nice and sleek for easy shuffling, and the digital art is fantastic (I usually don't like digital art decks) with vivid, swirling colors inside heavy dark lines. Each suit has a theme to go with the element it represents, but the Major Arcana don't seem have any sort of indicators to represent which element they are (example: 0 The Fool is Air but there's no color border or anything to signify that) so you may have to learn that with a different deck or just memorize a list so you can tell when they are well- or ill-dignified with other cards. WHERE I'M COMING FROMI'm a professional Psychic Tarot & Divinatory Reader. While I don't *need* tools to do a reading, I LOVE tools! :-) Also tools can enhance a reading and since I'm visually (as well as verbally) oriented, I love delving into scrumptious images which enhance the psychic impressions received.Now I normally avoid sharing my "trade secrets" with people [that was then but I share now!!] but two things are of issue here: 1. I want the Revelations deck to become a "classic" so I can buy a deck whenever I like as opposed to "stockpiling decks" like I often do (worried about tools going out of print), 2. Zach Wong is a wonderfully *nice* person whom I'm compelled to promote! :-) [I don't know him personally but he always answers my questions in a prompt and pleasant way -- mind you, my questions are about 15 words long -- unlike this review! haha].DECK IMPRESSIONSAs of January 15, 2006 Revelations IS the only deck, that I'm aware of, that has reverse images to reflect the reversed Tarot meanings of each card. Imagine getting a reversed card (if you work in both upright and reverse) and just seeing an upside-down image. If you are visual, like me, this is an annoyance because it's difficult (though not impossible) to glean visual information and rather one might go from stored memory to come to the meaning of the reversed card or forget about the card and rely on intuition or psychic impressions instead. However, with the Revelations deck a "brand new image" appears in the reversed position ( http://www.psychictarot.tarotreader.c... Example) to offer additional or differing meaning from the upright position.The Revelations deck has an abstract surreal quality to it with a lot of fine and enlarged details going on. It can be used both as a reading and meditative deck. The colour usage seems symbolic and I find myself gaining immediate "impressions" from the cards as the hues impart great information. As I lean in and take a closer look, more information is received from both the fine and enlarged shapes and drawings. I have no complaint other than I would like to see the astrological symbols on each card with a longer lasting card stock.THE DECK TO GET -- For beginner and advanced TarotistsThe Revelations Tarot Book Set is THE deck to have in addition to any or all of the original or inspired versions of these classic Tarot decks: Rider-Waite, Thoth, and a Marseilles.But let's say you only want one deck and would rather use intuition instead of reading a whole bunch of books on what Tarot means -- THIS deck is it. 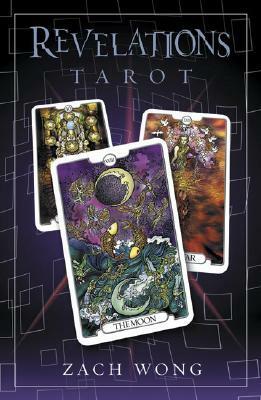 However, instead of it being a lighter version -- how most *you don't need to study Tarot for long* oracle-type decks are -- this deck is intense and both beginner and advanced Tartoist will find tremendous value in it.If the deck wasn't enough, this set comes with an organdy black silky bag, box for the deck (which you can colour or place stickers on -- basically personalize the cardboard box) and a companion book about the cards meanings (a key idea, upright and reversed meanings, image and colour symbology).THE COMPANION BOOKHowever, unlike many books the writing is clear, clean, and sparse. Now some might say sparse is not good but the old adage goes here, "less is more". He says what he needs to say, in a very personable manner, and doesn't fill the book with a lot of fluff. And who needs to read fluff in such a fast paced world? This tarot... It's truly one of a kind, and something I've never had the pleasure of seeing before. It's the only tarot that I've been able to find that has gorgeous artwork, and can ALSO be read inverse. The pictures are designed in such a way that reversing the card gives you a new story to get from the card, which is HUGE in terms of learning the meanings of the cards. The symbolism is so easily to translate, I recommend this deck to ANYONE. Beginners will find this deck easily to learn off of, and experienced readers will appreciate the stunning artwork. Truly a magnificent tarot deck. Gorgeous! When I first saw pictures from this Tarot deck I was desperate to get my hands on it. And I was delighted. The reversals are amazing - I love what Zach has done with them - it's so clever! Glorious is the only way to describe the colours. I think this deck started my passion for collecting! A very cool deck with reversible images. Free eBooks Orangebitcoin.elmundonaranja.com.co Library is in no way intended to support illegal activity. We uses Search API to find the overview of books over the internet, but we don't host any files. All document files are the property of their respective owners, please respect the publisher and the author for their copyrighted creations. If you find documents that should not be here please report them. Read our DMCA Policies and Disclaimer for more details. Copyright ©2019 Free eBooks Orangebitcoin.elmundonaranja.com.co Library - All rights reserved.